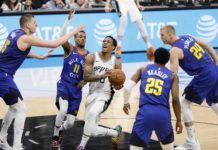 One of the most colorful franchises – both literally and figuratively – in all of sports, the Denver Nuggets recently turned in their 40th year in the National Basketball Association. Seems like a great time to take a look back, identifying some of the organization’s most-colorful characters. Editor’s Note: Many of the players that follow crossed timeframes. Rather than including those players in multiple eras, the staff at Mile High Sports voted as to which era they were most associated. Send your thoughts (and criticisms) to [email protected]. The Rainbows. Amazing Grace and Chuck. McNichols Arena. Many say the ’80s were the golden era of the Nuggets. They’re probably right. But what about those early ’90s? There were some great times then, too. For most Nuggets fans, Abdul-Rauf falls into one of two categories: He’s either one of the most-talented, pure scorers the Nuggets have ever had, or, he’s a classic case of “what could have been.” As a rookie (then Chris Jackson), he was a Second Team All-Rookie selection. After a rough sophomore campaign, he rebounded, averaging 19.2 points per game and earning honors as the NBA’s Most Improved Player. His lightning quick jumper was one of the smoothest in the NBA and he was undeniably a major piece of the Nuggets core. But, in March of 1996, Abdul-Rauf refused to stand for the National Anthem, stating that it was in conflict with his Islamic beliefs. Following the season, he was traded to Sacramento. 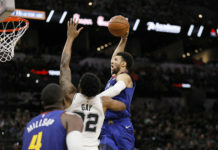 Dubbed “The Long Ranger,” the 5-foot-10 Adams ignited Denver crowds on a nightly bases with his fearless shooting efforts. His unorthodox, “from the hip” shooting motion set him apart, but he also made plenty. Perhaps his greatest feat as a Nugget was a 79-game streak in which he successfully made at least one three-pointer. In the 1990-91 season, and without many other scoring options, Adams poured in a whopping 26.5 points per game. As a Nugget he averaged 18.2 points and 7.2 assists. 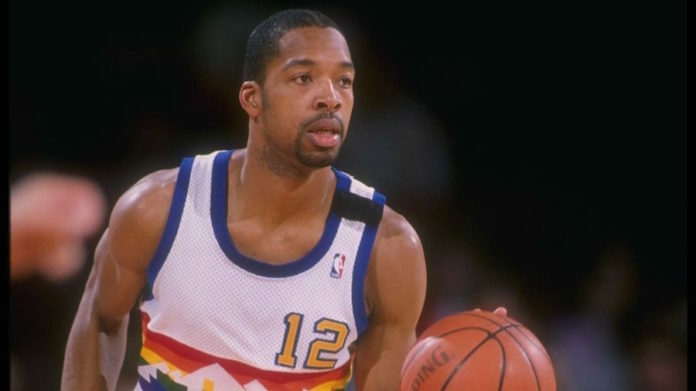 A predecessor of sorts to Dikembe Mutombo, “Coop-a-loop” was a fan favorite for five seasons during the Nuggets heyday. In three different seasons, Cooper finished as a top-10 shot blocker in the NBA. As a Nugget, he averaged 2.4 blocks per game. 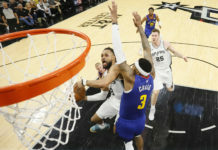 Add on a scoring average of 9.5 and a 7.4 rebounds (almost five of which were on the offensive glass) per game, and Cooper was a solid contributor on several very good teams. Playing for 10 years and 734 games, which ranks fourth in franchise history, Dunn started 62 percent of his time in Denver. Yet, he only managed a scoring average of just under 5 points per game. He was a fixture, however, for one reason: Defense. Dunn was one of the NBA’s toughest perimeter defenders; he was named to the NBA’s All-Defensive team on three occasions. Perhaps no player in Nuggets history defines the franchise as Alex English does. Throughout the ’80s English was one of the Association’s most prolific scorers, averaging an impressive 25.9 points per game while in Denver. In the ’82-83 season, he led the entire NBA at 28.4, and posted scoring averages of 29.8 and 28.6 in the ’85-86 and ’86-87 seasons. English didn’t miss an All-Star game from 1982 to 1989 – eight straight appearances – and is still the franchise’s all-time leading scorer. His No. 2 has been retired in Denver and he was inducted into the Basketball Hall of Fame in 1997. Evans will rarely be considered a player that fueled the high-flying 1980s Nuggets teams, but his contributions are also underrated. Evans was a hard-nosed, defensive-minded guard. But he could also shoot. His odd, knuckleball spin worked well, as he shot a respectable .453 from the field as a Nugget. Despite averaging under 18 minutes played per game, Evans still managed to score at a respectable 8.7 points per game clip. While Alex English was regarded as the Nuggets best scorer, it was Lever who was unquestionably the most well-rounded. Largely flying beneath the national radar, the never-flashy Lever was solid in every aspect. He was a triple-double machine, accomplishing the feat 46 times in his career, including three in the playoffs. That number ranks sixth all-time in NBA history. Furthermore, despite only playing six seasons in Denver, Lever still holds the franchise record for steals with 1,167. On Opening Night this season, the Denver Nuggets honored Dikembe Mutombo by retiring his No. 55 jersey. While only a Nugget for five seasons – his longest stretch with any team – his numbers were impressive. In fact, he averaged a double-double in Denver, pulling down 12.3 rebounds and scoring 12.9 points. But it was his defense that Nuggets fans adored, more specifically, it was his signature finger wag that followed his 1,486 blocked shots. The image of Mutombo clutching the ball on the court following Denver’s upset of Seattle in the 1994 NBA playoffs has become one of the most iconic visuals in Colorado sports history. In the mind’s eye of a typical Nuggets fan, Calvin Natt probably stood somewhere close to 7 feet tall. Natt was a power forward in the truest sense of the word – massive and strong – but in reality he was nowhere near the 7-foot mark. The real Natt measured up at a mere 6-foot-6. With a larger than life presence, bulging muscles and a cold stare that could cut through the toughest of opponents, it could be argued that Natt was the heart and soul of the Nuggets. He averaged 17.8 points and 6.3 rebounds, but more importantly, he was the backbone of the frontcourt that anchored some of Denver’s best teams. On mostly mediocre teams, Williams was a standout scorer for the Nuggets. Despite having somewhat of a journeyman’s career, his six years with the Nuggets was the most consistent of his career. In Denver, he was called upon to score, averaging 18.2 and 17 points per game in the ’91-’92 and ’92-’93 seasons respectively. And even though he had a rail-thin frame, he also pulled down 4.6 rebounds per game with the Nuggets.